Sanitary containers REM offer a quick solution when you’re in need of a prefabricated portable cabin. If you associate sanitary container with foul smelling, dirty and unappealing chemical toilets, you’re wrong. REM portable cabins for sale are innovative, spacious and practical. They enable standard hygiene and cleanliness, you’d expect at home. Why choose REM sanitary containers? REM sanitary container come with all the necessary plumbing installations and sanitary equipment, including toilets, sinks, shower cabins, washing basins etc. The equipment of sanitary container can also be custom made to completely satisfy your needs and we can also add pumps for the distribution of water and, if necessary, water tanks. All the sanitary elements of the container can be made out of polyester, white ceramics or stainless steel. Sanitary containers are much cheaper that ordinarily built toilets, however, they still represent an investment, so we recommend to choose a reliable manufacturer, and REM definitely fits the description. 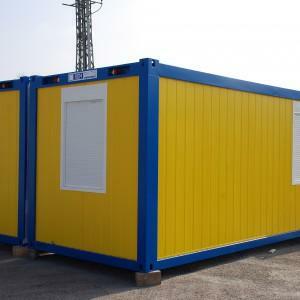 Not just sanitary containers, even all other modular buildings are of high quality, sturdy and safe. The walls are protected with galvanized or painted sheet metal, which enables, firstly easy cleaning and maintenance, and secondly long life span. When it comes to flooring of the REM sanitary containers, there are several options: PVC floor coating, dotted rubber or self-levelling single component flooring. Where to use a portable cabin? Portable cabins of all sorts (sanitary containers, modular office units, modular apartment buildings, educational facilities, laboratories etc.) come in handy, when we need a quickly built, cheap and easily transportable space for business and even personal use. Portable cabins are prefabricated off site and then transported to the location, where we need them. The dimensions, layout and design options of a portable cabin are almost unlimited and the benefits are numerous. For more information, feel free to contact the company REM.